Earth Recordings continue their reissue program of the legendary guitar player’s back catalogue. Louder Than War’s Craig Chaligne reviews the second instalment “Moonshine” originally released in 1973. 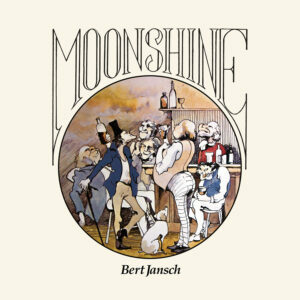 Moonshine was released amid troubled times for Jansch. The album originally came out on Reprise records at a time when the label was undergoing one of this perpetual personnel reshuffles that record companies seem to undergo. The result was that the album went totally unnoticed and sunk without a trace. Jansch’s band The Pentangle imploded in the same year so 1973 didn’t turn out to be a fantastic year for the folk guitar hero. It’s a crying shame that the record didn’t achieve more recognition as it features quite an impressive cast. Produced by Bert’s Pentangle colleague Danny Thompson (who also plays bass on most of the tracks), it features Tony Visconti on arrangements and a guest appearance by legendary singer Mary Hopkin on one song. With a cast like that the album had everything to succeed, alas it didn’t turn out that way. Maybe a bit more arid in its content than its predecessor Rosemary Lane, Moonshine is still a strong record with a good selection of songs and fine instrumentation. Starting with “Yarrow” a traditional salvaged from The Pentangle days, it follows it with another one “Brought with the Rain” featuring Danny Thompson’s trademark glissandos and Ralph McTell on harmonica. An excellent version of Dave Goulder’s “January Man” is a highlight with its subtle guitar and harp interplay. “Night Time Blues” is probably the weakest of the three Jansch originals on the record but that is more than made up by the title track where Jansch’s voice and diction work perfectly with the music. The other original “Oh My Father” has a very different feel than the rest of the album, featuring a rockier instrumentation (with drums and electric guitars), it finishes the record on a upbeat note. Jansch has a very distinctive voice so it’s surprising too see how well his duet with Mary Hopkin on “The First Time I Ever Saw Your Face” works. The solo acoustic number “Twa Corbies” shows that our host can still shine by himself with just his guitar as an accompaniment. For further information on Bert Jansch you can check his official website: bertjansch.com and the website of Earth Recordings which is re-releasing his back catalogue. Most of the information on the 12 Bar recordings comes from Colin Haper’s excellent Bert Jansch biography Dazzling Stranger, an excellent read and a must-have for every person interested in the Scottish musician’s history.